← Bible Contradictions #38: Does god work on the sabbath? The Byrds’ 1965 classic “Turn! Turn! Turn!” captured well the biblical narrative that killing is sanctioned by god. Here, go ahead and play the song while reading this post. The song quotes Ecclesiastes chapter 3, which states — paraphrased — that everything has its time, and murder is no exception. The verses in question can be found here. But the bible doesn’t stop there. It’s chock full of offending quotes sanctifying killing (and I’m not even counting all the verses where god is culprit). Kill witches (only the female kind). Kill your brother, friend, and neighbor. Execute sabbath breakers. Murder innocent babies, women, and animals. To be fair, all of these links take you to the Old Testament. But let’s not get confused about this. Jesus had no problems with OT cruelty. Furthermore, in the NT Jesus condemns parents for not killing their misbehaving children. So this approval of killing is pervasive throughout the bible; it’s not limited to the OT. But the bible contradicts these verses several times. First, the ten commandments clearly say not to kill (here and here). Mark repeats these words. So does Luke. In Matthew Jesus confirms the prohibition against killing. If you look to the bible for guidance when deciding whether or not to kill someone, you have a 50/50 shot of ruining your life and spending the rest of it behind bars. Don’t take that chance. If you ever get the urge to kill someone, don’t do it. This is one of those “sins” that’s easy. You don’t need the bible to tell you it’s wrong. But if you use the bible, it might make you think murder is ok. This entry was posted in Atheism, Bible Contradictions and tagged Atheism, atheist, Bible Contradictions, Christianity, Christians, contradictions in the bible, God, Jesus, Religion, the bible, The Byrds. Bookmark the permalink. 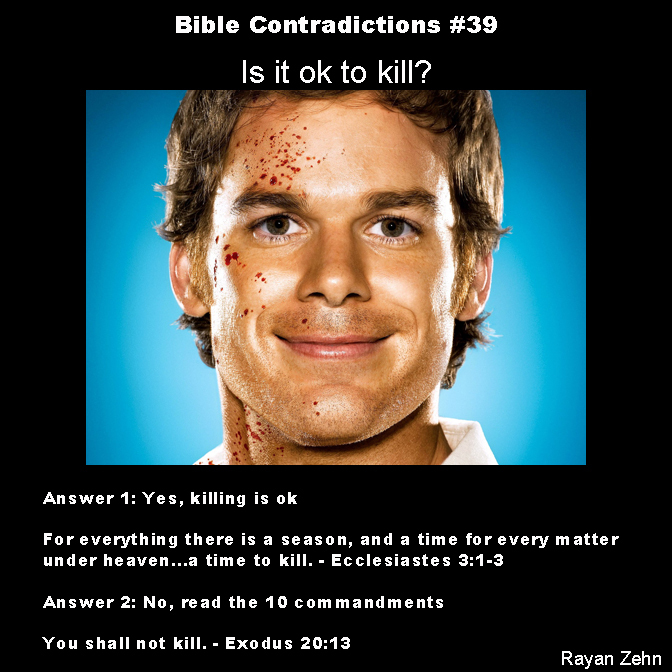 1 Response to Bible Contradictions #39: Is it ok to kill? Are you unaware of the huge difference between the words ‘kill’ and ‘murder’?? ?